Former presidents George W. Bush and Barack Obama are expected to speak at U.S. Sen. John McCain's funeral service and he will lie in state in both the nation's capital and Arizona, according to plans taking shape Sunday. A day after McCain died of brain cancer at 81, his family, friends, and congressional and state leaders were working out details of the farewell for the decorated Vietnam War hero, prisoner of war and six-term senator. The website for McCain's office said the senator's body will lie in state and have funeral services in Arizona on Wednesday and Thursday. The procession will then head to Washington, D.C., where McCain will lie in state in the U.S. Capitol Rotunda. There will then be a procession past the Vietnam Veterans Memorial and a funeral service at Washington National Cathedral. A private funeral is planned at the U.S. Naval Academy in Annapolis, Md. Since his passing, politicians from around the world have emphasized McCain's bipartisanship, respectfulness and ability to work constructively with colleagues — no matter their political stripes. "These were bitter contests, both of them," said Sen. Jeff Flake, a Republican from Arizona. "To ask them to speak at your funeral, and for them to be honoured at the opportunity, that tells you all you need to know." But McCain had long feuded with President Donald Trump, and two White House officials said McCain's family had asked, before the senator's death, that Trump not attend the funeral services. Vice-President Mike Pence is likely to attend, said the officials, who spoke on condition of anonymity to describe private discussions. The tributes were to begin in his home state, move to Washington in the first week of September and end with McCain's burial on a leafy hill at the academy next to his best friend from the class of 1958, Adm. Chuck Larson. Flake told CBS' Face the Nation that McCain "was quick to forgive — certainly put the good of the country above himself, and the fact that his former opponents will be there speaking says all we need to know." McCain died at his Arizona ranch after a year-long battle with brain cancer. A black hearse, accompanied by a police motorcade, could be seen driving away from the ranch near Sedona where McCain spent his final weeks. For 80 kilometres along Interstate 17 southbound, on every overpass and at every exit ramp, people watched the procession. Hundreds, including many waving American flags, parked their cars and got out to watch. 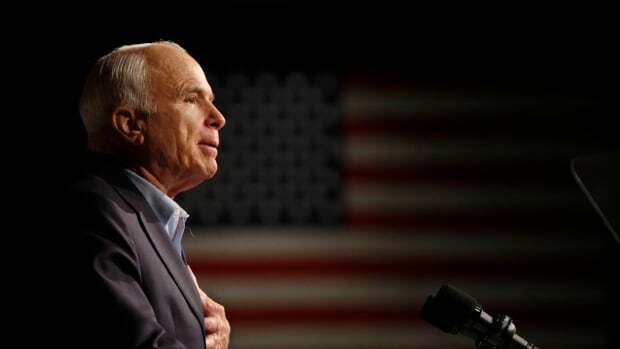 Arizona will accord McCain that honour on Wednesday, when he would have turned 82. "This is a rare and distinct occurrence for a truly special man," GOP Gov. Doug Ducey said in a tweet. Ducey does not plan to announce his selection of a Senate successor to McCain until after McCain's burial. Under state law, the governor's appointee to serve until the next general election in 2020 must come from the same political party. A statement from Ducey's office said that "now is a time for remembering and honouring a consequential life."